Not a pub, obviously. Not the best Davey House either. Friends and I use the small private dining room for boozy get togethers over a meal; I wouldn't dream of using the place as a boozer. Limited for beers and lagers but good for wine, naturally. Although it does serve an excellent pint of ale in a pewter tankard, I have always used this place as a wine bar and in that category it, in my view, excels. Excellent and, for the West End, not too pricy wine list and super sandwiches - the roast beef is without equal. My only moan is that they serve wine in the 175 cc glasses and that is a bit small if you just want the one. This place is ok for a subdued pint of Old Wallop (which is the only ale offering) whilst talking shop with work colleagues before jumping on the train home, but it is not a bar that I would choose as my destination for the entire evening. Usual Davy�s set up, so good if you like that sort of thing. Have been in here many times over the years. Useful place to meet someone travelling via Charing Cross station. Can usually get a seat here when it is impossible at Gordon's. Inevitably mainly patronised by office workers, but the place has a decent ambience in my opinion. Old Wallop can be good, if pretty expensive, but I have had the odd dodgy pint which is only detected with the first gulp, because the use of pewter tankards prevents you from seeing if there might be anything wrong with it. Also, I do not rate the house wine very highly. I would not come here for the quality of the drink on offer. 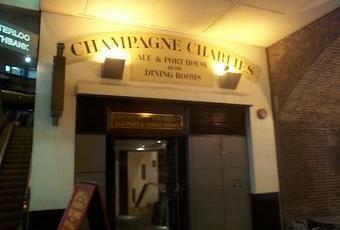 Some trivia - used to be a pub called The Villiers above it, pretty well where the escalator is now. Later renamed the Buckingham (Villiers being the family name of the Dukes of Buckingham).